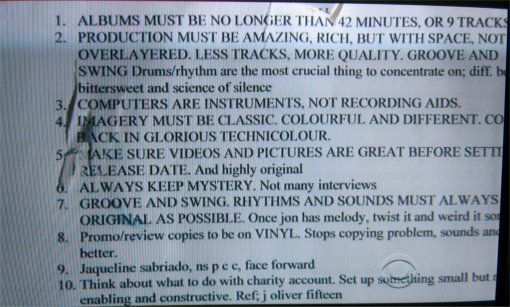 These are the Coldplay “band rules” posted on the wall in Chris Martin‘s London studio. During his interview with Steve Kroft of 60 Minutes the camera paused long enough on them for me to freeze the frame and copy them down. 1. Albums be no longer than 42 minutes, 9 tracks. 9. Jacqueline sabriado, ns p c c, face forward. There were more, but the camera didn’t pan down far enough. A nine song, 42 min album just seems pathetically short. Then again, I don’t understand anything at all about the Coldplay phenomenon. Most of all their popularity. Sigh. Well, at least they actually have a credo to stand by. Most musicians just play whatever is spinning around their head, giving us a bunch of gems & phooey in the same mix. Jazz legend Herbie Hancock said Miles Davis had his own band rules, one of which was ”don’t bring your practice-sound to the stage . . . save that for “practice. '” That’s a truth passed down from one master to another, and one so many other music artists should adopt. How many times do you hear your favorite performer, and the mess he or she gave you onstage sounds NOTHING like the beauty recorded on their album?